Well I don’t have to say pasta is my favorite meal. Really doesn’t matter what kind I love it all. This recipe uses jumbo pasta shells but I like to think of it as just as another way of making lasagne. Really, it has all the same ingredients. Pasta, meat sauce and cheese. Ok I also have added spinach but there are some lasagnas out there that do use spinach. I have made this filling for years but normally I put it in cannelloni. This time I thought why not stuff some shells. It worked out well and I found it easier to put the cheese mixture into the shells. My little granddaughter doesn’t like red sauce if served on pasta, but for some reason she will eat it on pizza and baked pasta. She really loves lasagna. 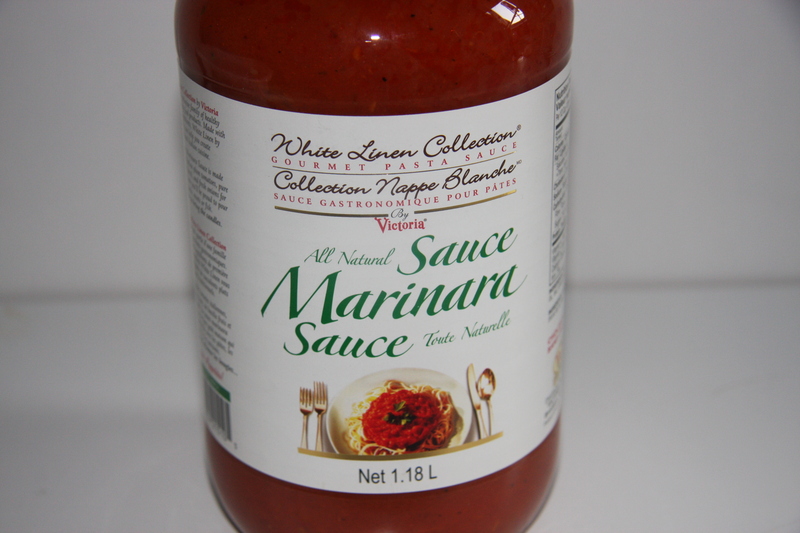 So I am trying to impart on her my love of pasta made all different ways, including with red tomato sauce. 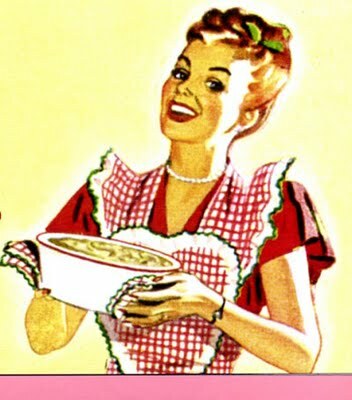 I have not made this recipe for her so I’m hoping when she does have it, she will love it. Now her brothers will pretty much eat anything, so I’m sure they will enjoy it. Fingers crossed. 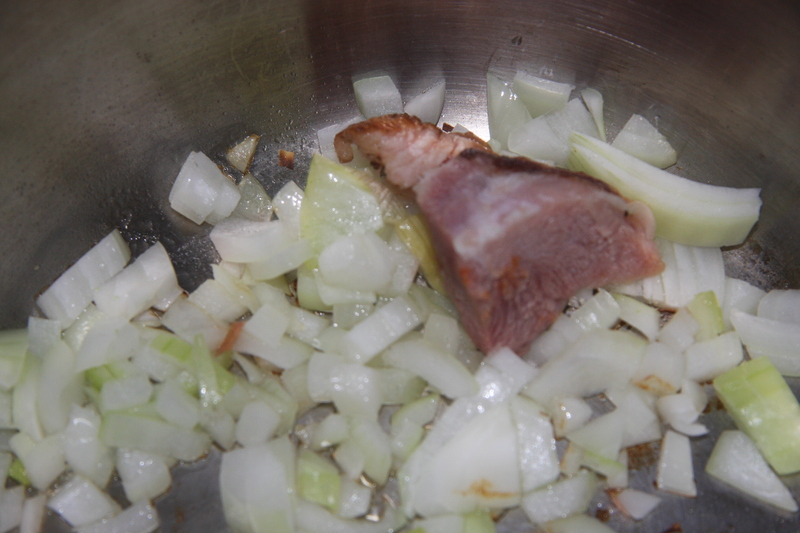 Place into a stock pot and fry in some oil. I added a piece of bacon. 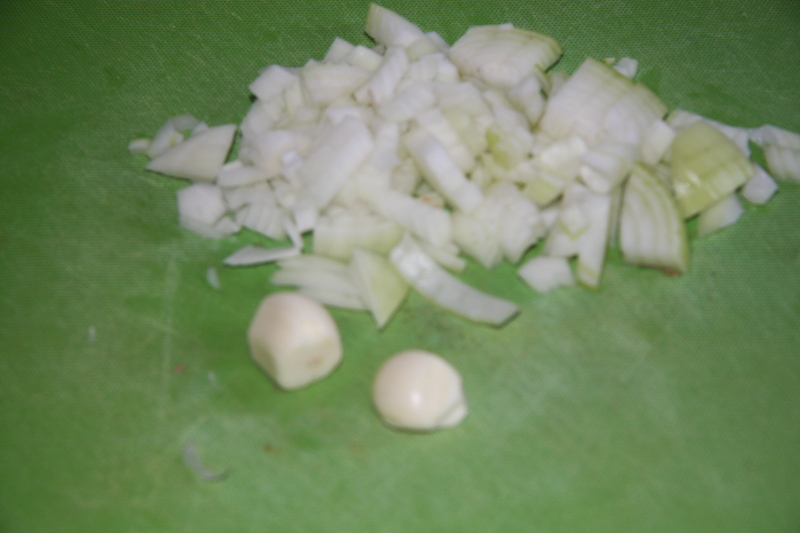 Shred 2 garlic cloves and fry until meat has browned. I added my favorite store bought sauce from Costco. I normally make my own from scratch but every once in a while I cheat and use store bought sauce. Trust me if this wasn’t good I would make my own. 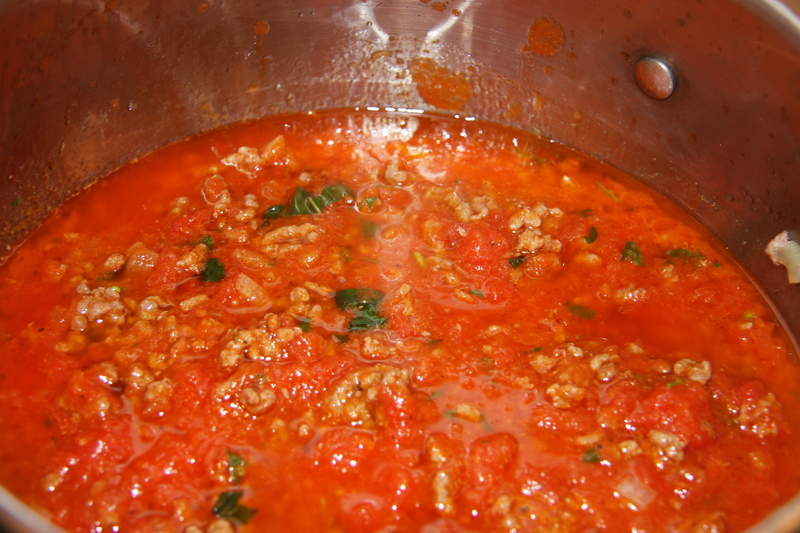 Allow it to simmer for 1 hour partially covered while also adding chopped parsley and basil. 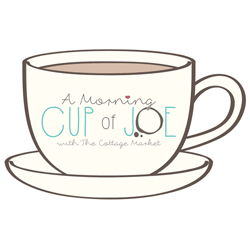 All totaling about 1/4 cup. Into a bowl I added 1 – 1/4 lbs. 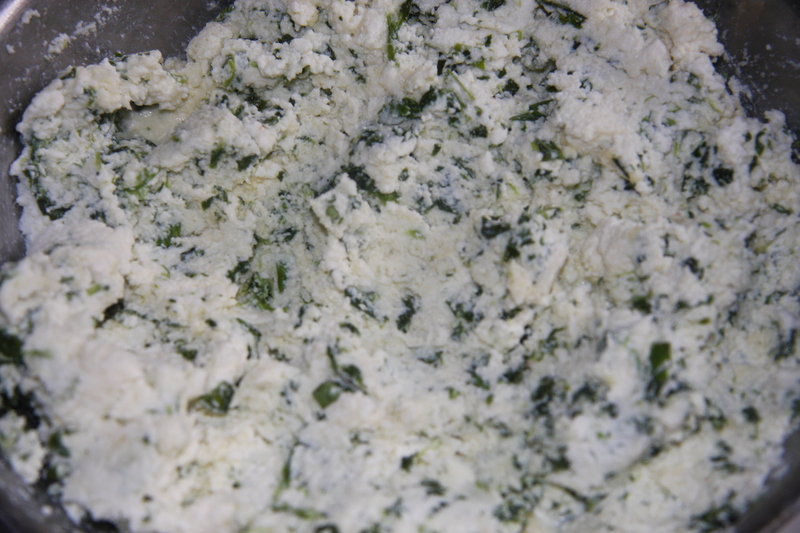 of ricotta cheese, 1 cup grated mozzarella cheese, 1/2 grated Parmesan cheese, 1/2 cup chopped spinach and salt and pepper to taste. Cook 1 box of jumbo shells according to package directions. Proceed to place about 1 heaping teaspoon into each shell and place into a pan that is covered with sauce on the bottom of the pan. 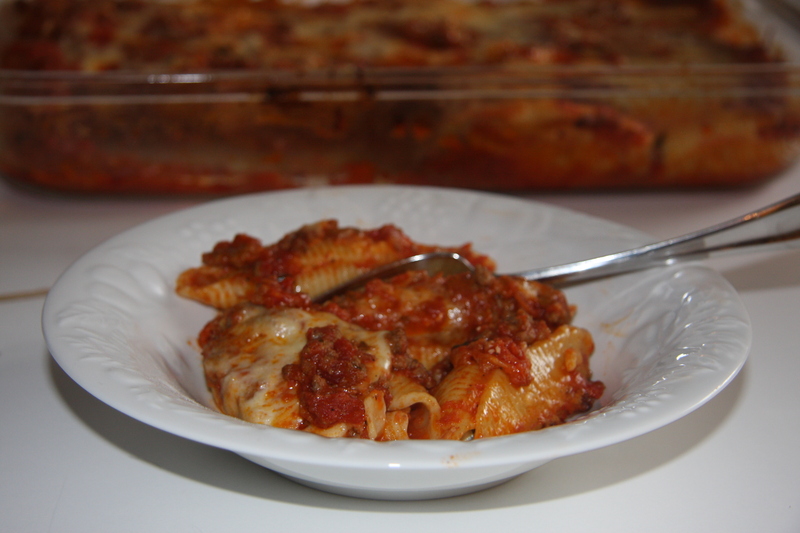 Top shells with remaining sauce and some extra mozzarella cheese. Bake covered with foil, 350 degrees for 45 minutes. Must all be heated through out. Great dish. 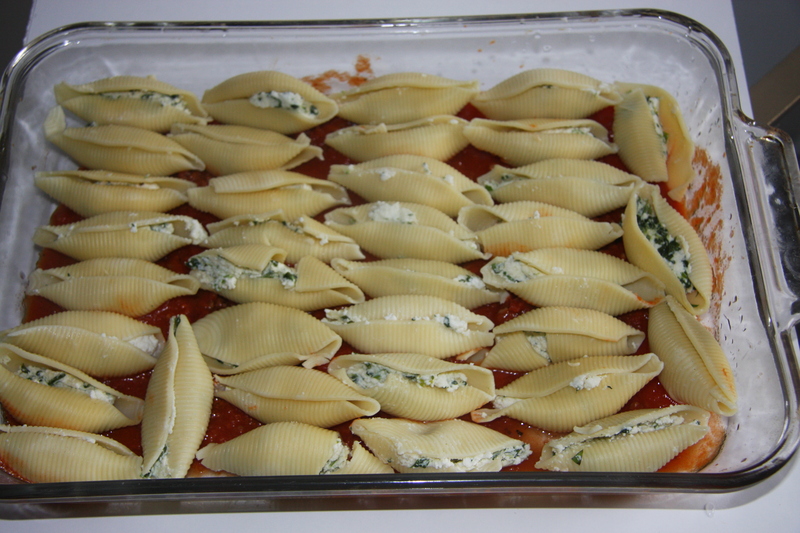 If you make more stuffed shells then you need to prepare the recipe to the end and instead of baking it, cover with foil and freeze. When you need a quick supper, just defrost and bake. In a stockpot add a couple of glugs of extra virgin olive oil. When hot add the onions and fry until translucent. Add garlic and pepperincino and fry for a minute. 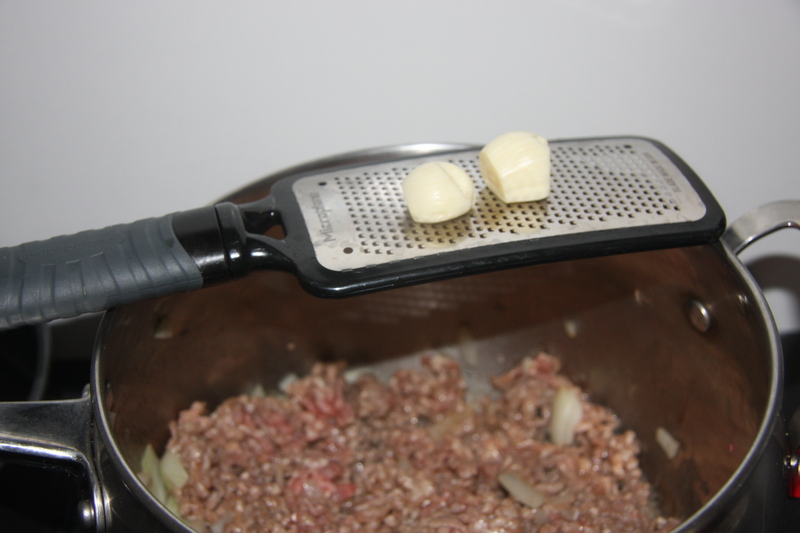 Add ground beef and fry breaking it up into tiny pieces until the meat is no longer pink. Next add the tomato sauce, mix well and slightly cover. Simmer for 30-40 minutes. 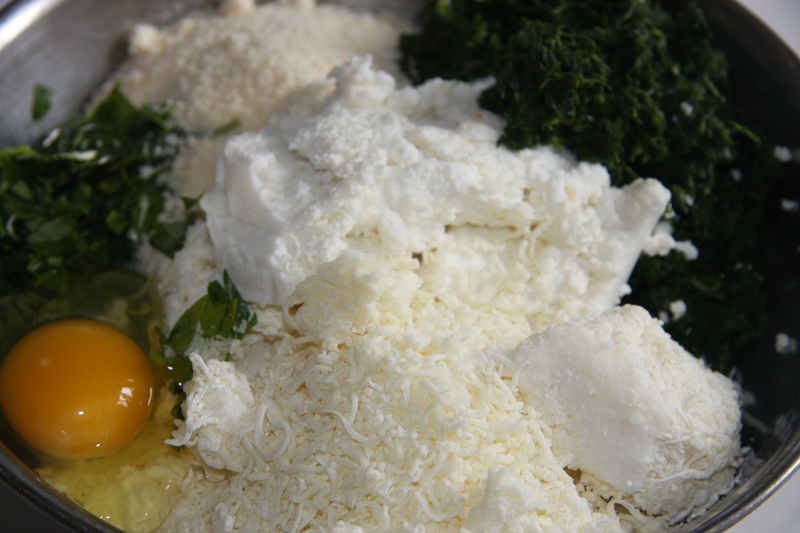 Mix together all the cheeses, egg, nutmeg and spinach. Set aside. In a large stockpot add 1 tablespoon salt and bring water to a good boil. 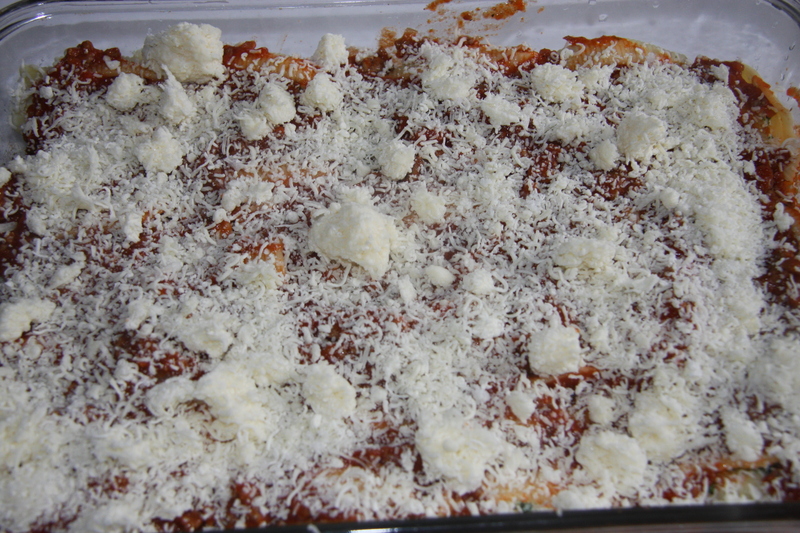 Add the pasta shells and cook according to the package directions. 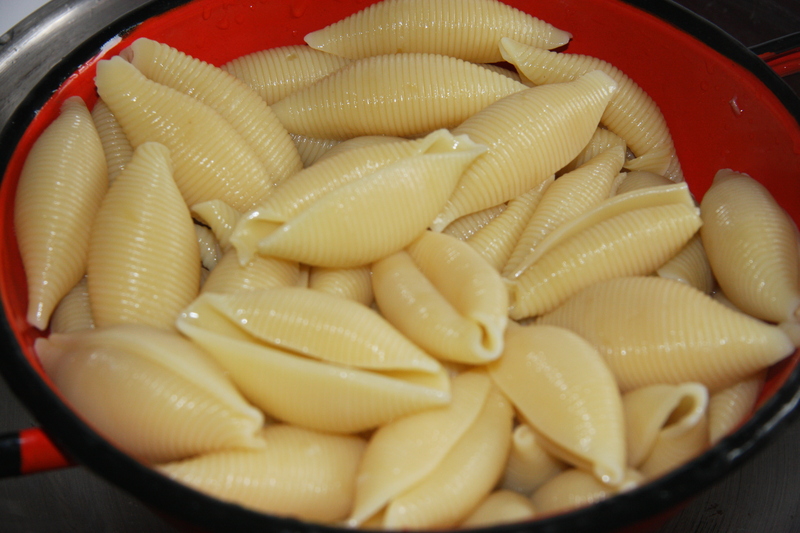 When the shells are cooked al dente, remove from water and quickly rinse with cold water. This will stop the cooking of the shells. Set aside. When shells have cooled place some of the cheese mixture into each shell. Placing the shells into a pan that have been lined with meat sauce. When you have finished stuffing the shells, top with extra cheese. 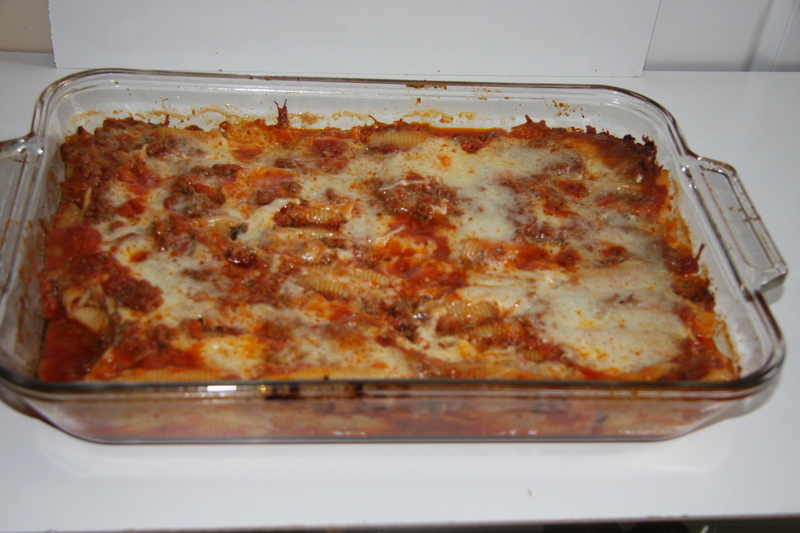 Cover with foil and bake approximately 1 hour or until the ingredients are piping hot and the cheese on top has melted. Serve with a salad and some crusty Italian buns and you have a meal fit for a King or Queen.